Daylilies are members of the lily family (Liliaceae) and are a perennial favorite for area gardeners. The daylily’s scientific name, Hemerocallis, is a combination of the Greek words for beauty and day – a fitting description for a blossom that opens at dawn and withers by dusk. Fortunately, each stem produces numerous buds that bloom at different times, allowing visitors to enjoy daylilies for most of June and July. 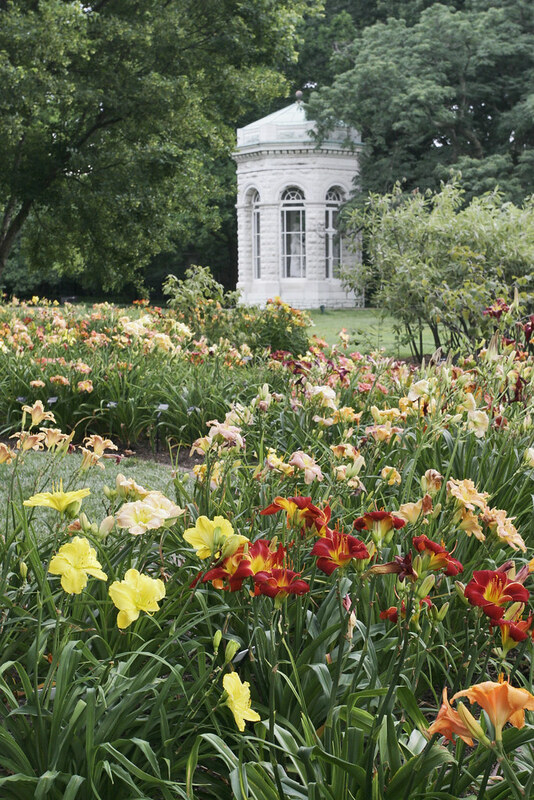 The Garden displays more than 2,000 specimens, with over 1,800 in the Jenkins Daylily Garden. Of those hundreds of plants, there are over a dozen species represented and over 1,700 different hybrids. The Jenkins Daylily Garden is a sanctioned American Hemerocallis Society Display Garden. The collections are largely overseen by the local Missouri Botanical Garden Daylily Association and the West County Daylily Society. The modern daylily originated from plants growing in China and Japan where they have been cultivated for centuries. Early accounts in Chinese literature report the plant’s roots and flowers being used for food and medicine. Boiled young shoots and fresh roots were consumed to prevent a variety of ailments including fever, hemorrhage, jaundice and cirrhosis. Within the last 75 years, hybridizers have bred great improvements into the daylily from the wild forms found in the Far East. Most of these have been directed at improving the form, flower color and hardiness. Wild daylilies are only the colors of yellow, orange and fulvous (a pale, rusty orange hue). Now the color range has expanded to pinks, purples, pastels, near-blue and a wide assortment of patterned colors.